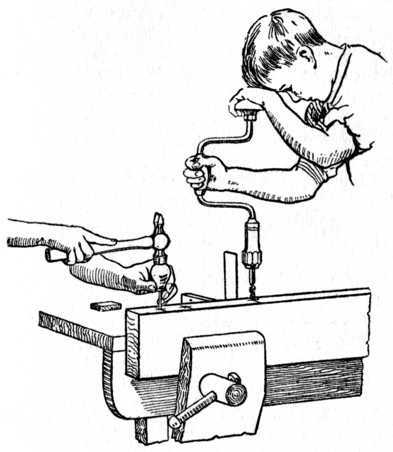 Making Dowels.—Many, however, prefer to make what they require for the work in hand, and the following is the method that is generally employed. Pieces of straight-grained wood are wrought to a square section, after which the corners are planed away to form an octagonal section. 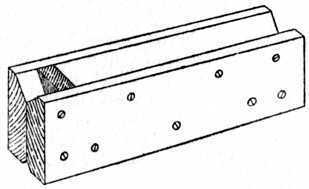 The sharp corners are now planed away, and the roughly formed dowel is driven through a steel dowel plate, Fig. 190, by the aid of a heavy hammer, thus giving the necessary roundness and finish to the dowels. When hammering dowels through a plate the hammer should on no account be allowed to come in contact with the face of the dowel plate, or the cutting edge of the hole will be spoilt. Simply drive the dowel to within 1⁄8 in. of the plate and knock it out with the next dowel. 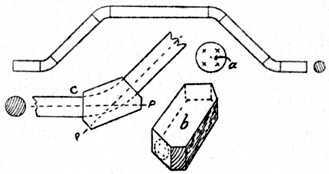 To plane off the corners a “cradle” (Fig. 191) is made and kept for the purpose. The advantage of this cradle is obvious, preventing as it does any tendency of the partly-formed dowel to slip or wobble. 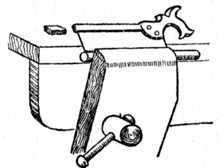 A jig, or cradle, is easily made by bevelling the edges of two separate pieces of wood and then glueing and screwing them together as at Fig. 191. A small block of wood is inserted to act as a stop whilst the planing operation is in progress. It is usual to bevel both edges of the timber from which the cradle is formed, thus accommodating all sizes of dowels from 1⁄4 in. to 5⁄8 in. in diameter. A safe rule for the spacing of dowels when jointing sideboard tops, dressing table and wardrobe ends, etc., is to place the dowels 9 ins. to 10 ins. 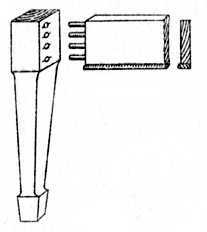 apart, and place two dowels at each end as shown at Fig. 198. The length of the dowels should be about 7⁄8 in. to 11⁄4 in. long. Fig. 199 shows the two boards prepared ready for glueing. The back one is bored to receive the dowels, and the front one shows the dowels glued in position. It is customary to warm the edges of the boards before spreading the glue, and cramps are required to squeeze the joint tight. These should be left on the jointed board from one to four hours according to the state of the weather. In cases where thick timber (say 2-in. or 21⁄2-in. boards) is to be jointed, two rows of dowels may be used, the position of the dowels being as Fig. 200. Fig. 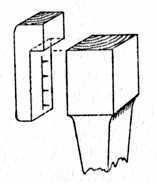 205 is a wooden block made in two portions and held together by screws; it is used to fasten around a twist bit, the object being to ensure that all the dowel holes are of uniform depth. It may be adjusted as desired and firmly screwed round the twist bit; if the hole is made 1⁄4 in. in diameter it will clip round a 1⁄4-in. or 3⁄8-in. bit and will answer a dual purpose. It is a preventative for bad dowelling. Fig. 206 is an example of dowelling framing when the moulding on the edge has to be mitred. 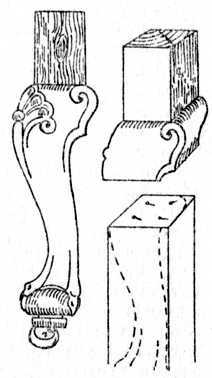 It is necessary to cut the shoulders away so as to allow the members of the moulding to intersect. 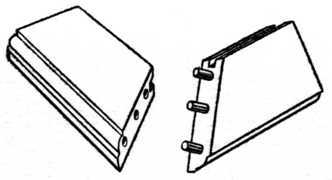 The section of the mould is not shown in the sketch for clearness of representation. The portion marked H is called the “horn,” and it is not cut off until after the frame is glued up; its object is to prevent the rail splitting or bursting when knocking up the frame or during the cramping process.